I am not a believer of food coloring. These azo, suflide, carbonate compounds that we can barely pronounce plus the color retention agents used in food nowadays can hardly classify as edible. But admittedly, everything, including food is always more vibrant and more appealing with color. 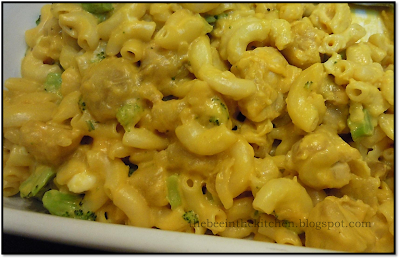 Thus, I've pondered on making the perfectly yellow mac n' cheese sans the yellow coloring. We all know that cheese alone doesn't do the trick. Sure, it will be pretty tasty, but as for the color, it will remain pretty much carbonara off-white. My secret? I used: PUMPKINS! Pureed pumpkins. Subtle flavor. Creamy texture and gives you the natural yellow you need. 1. Season chicken with salt and pepper, and dredge with flour. 2. Saute in small amount of oil, until chicken changes color, add broccoli and cook only until wilted, but the color pretty much remains the same. Set aside. 3. Boil milk, cook pasta in milk, adding liquid (water) if needed, but making sure to add just enough. Cook pasta until tender and liquid has dried. 4. Mix in pureed pumpkin, heavy cream, dissolved chicken bouillon and mix. Mix in Chicken and Broccoli, and finally mix in the grated cheese. 5. Transfer to a baking dish, top with the remaining parmesan and breadcrumbs. Bake for 10 minutes.